Business Description Realty & Community Magazine is a deluxe full color, full sized, high quality print magazine featuring Real Estate listings and related services, local business presentation advertisements, shopping, dining, staying, and local events information for regional communities. To View The Magazine Online go to: WeCrossMarket.com and click the magazine image from the home page. You can click on photos and ads throughout the magazine for more details about the offerings! The primary distribution area as of Spring 2013 is Northern & Central Arizona, covering areas such as Flagstaff, Williams, Valle, Grand Canyon, Sedona, Cottonwood, Clarkdale, Jerome, Camp Verde, Cordes Junction - Arcosanti, Black Canyon City, Rimrock, Anthem, and many White Mountain communities like Pinetop-Lakeside, and Show Low. 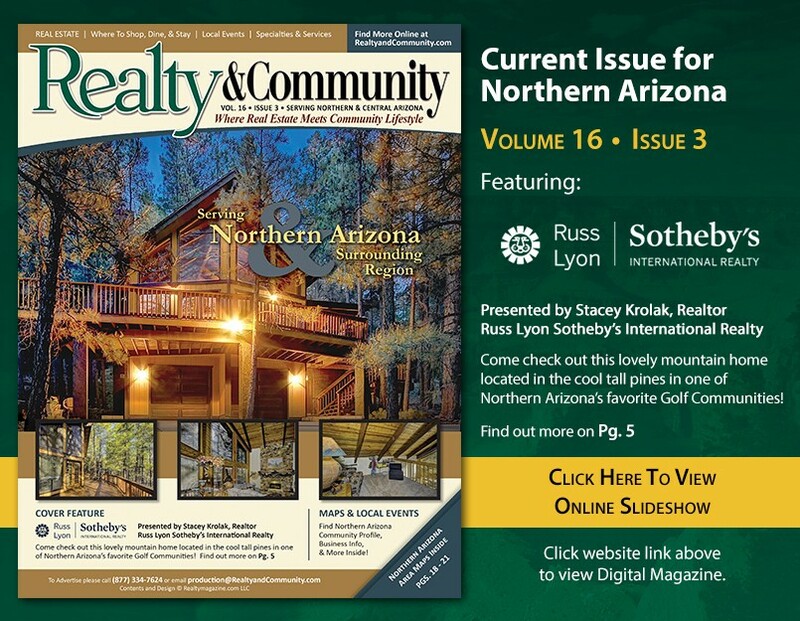 Realty & Community Magazine is the natural compliment to the RealtyandCommunity.com online Regional Cross-Marketing Program online! If you are interested in advertising, or introducing Realty & Community Magazine in your own local area, please contact us at 877-334-7624. Email: production@realtyandcommunity.com. We look forward to serving you!